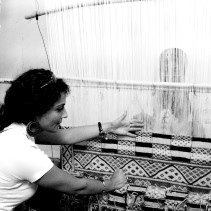 Benan Grams (Ain Leuh Weavers Cooperative): Benan is a Syrian national, fluent in Arabic, English, and German. Benan earned a BA degree in International Business at the Georg-Simon-ohm University for Applied Sciences in 2010, followed by a Master's Degree in Development Economics and International Studies from the Friedrich Alexander University in Germany in 2012. At the time of her fellowship Benan was studying for a Master’s Degree at the Arab Studies program, Georgetown University. After her fellowship, Benan wrote: "The ladies are great. Not only are they hard-working women but they are also open to new suggestions and adjustments. We had fun working together especially in shooting the pictures to make the catalog, even children and participating and helping. They have a lively working environment here." Girl up solidarity from Pyle in Maryland to Ain Leuh With the new sewing machine, No more dependence, We do it all! Weekly Market in Ain Leuh: the way back 1 Dirham extra! Ain Leuh, my destination for 2013, Where, Who, Why?